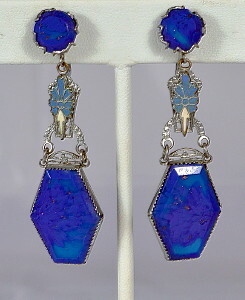 1920's vintage art deco long drop earrings. Cobalt blue art glass (faux lapis lazuli), blue & white enamel and rhodium plated base metal. Two part drop. Metal lace upper extender with floral blue & white enamel. Beveled hexagonal glass stone with silver tone set. Round glass button at screw backs. All original art deco era, true 1920's vintage.